يقع في مركز مدينة بيرث, فندق إبيس بيرث إنه المكان الأنسب لاكتشاف برث و ما يحيطها. يقع مركز المدينة المثير على بعد 0km فقط. يشكل هذا الفندق ملاذاَ مريحاً للاسترخاء ويمنح زواره فرصة للاستجمام والتجدد، وهو يقع على بعد خطوات من المعالم السياحية الكثيرة للمدينة كمثل: Margaret River Chocolate Factory, Perth City Concept Store, ‪Wesley Uniting Church‬, Essential Beauty Raine Square. استمتع بالخدمات الراقية والضيافة التي لا مثيل لها بهذا الفندق في برث. يقدم الفندق فرصة للاستمتاع بشريحة واسعة من الخدمات بما فيها: خدمة الغرف على مدار الساعة, أمن على مدار 24 ساعة, خدمة التنظيف يوميًا, مجهز لذوي الإحتياجات الخاصة, مكتب الاستقبال على مدار الساعة . يمكن للنزلاء الاختيار من ضمن مجموعة من الغرف المصممة بعناية لتعكس جواً من الراحة، والتي يتجاوز عددها 192. كما أن مجموعة الخدمات الواسعة الموجودة في الفندق لضمان راحتك تترك لك الكثير من الخيارات لقضاء وقتك أثناء فترة إقامتك. إن كنت تتطلع إلى إقامة مريحة وهادئة في برث، فستجد في فندق إبيس بيرث بيتك الثاني. Great value for money and close to everything. Got a cheap buffet breakfast deal through hotel which was great good selection. Room was clean and comfortable. Just about next door to the new shopping centre that has a first class cinema on second floor. Would definitely stay again. 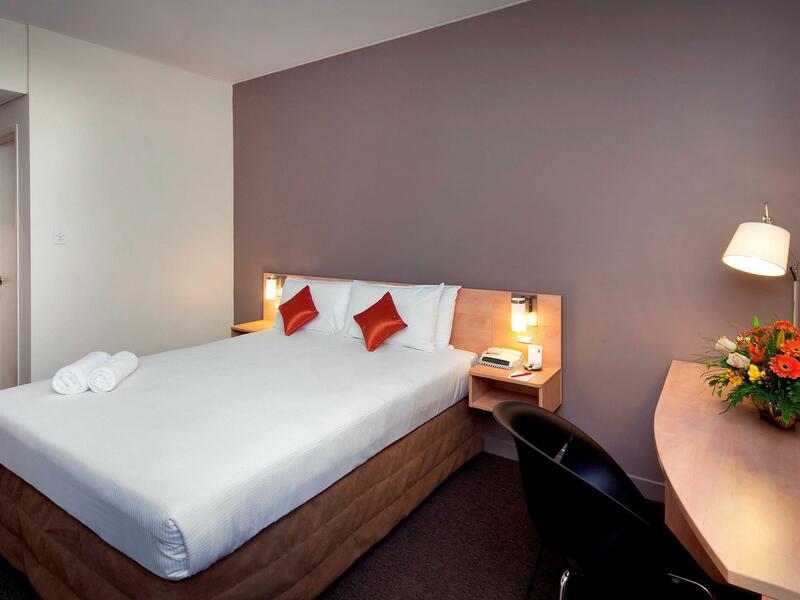 The Hotel is situated in the Perth CBD, making it very convenient to walk, shop, dine and explore Perth. The train station is only 3 mins away, giving access to any places of interest. However, during our stay, there was an issue with their water pump system, leaving us with no water supply for half a day. There was no announcement about the problem. We had to ask the reception before knowing about it. Another incident that took place was that there was a flower delivery but the hotel staff did not manage to notify us until we asked about it. Even when asked at first, no one knows about the delivery. It took them almost an hour to find the flowers. Good location. Booked quite last minute but price was still reasonable. Very comfortable bed. If you are on a road trip, do note that they do not have a free parking space. They have an agreement with a nearby public carpark. Can park overnight at a discounted rate of 20AUD for a whole day. For room 518. The electric kettle is old and thirty. The window blind is dusty. The carpet is old. The aircon is still cold after adjusted to ‘Low’. Overall everything is fine. Thank you. Close to everything. Close to Northbridge and Cultural Centre. Short walk to Elizabeth Quay and Swan River. Generally satisfied. Hotel also helped to book day tours to various attractions such as the Pinnacles & Wave Rock. Breakfast is good, but perhaps could be improved by providing different variety of food on different days instead of the same ones each day. Hotel Ibis Perth has always been a choice hotel for me whenever I am traveling with my friends. It is located 2 streets away from St George Terrace, hence within walking distance from Bus 380 bus stop, which is the bus from Perth Airport. From Hotel Ibis Perth, one can easily access numerous places, as the Transperth Bus Depot is just behind on Wellington Street. In addition, there is access to the CAT buses in the city as well. One can simply walk down to Hay Street Mall or Murray Street Mall, or take the CAT to Watertown, Kings Park, East Perth or walk down to Elizabeth Quay & the Bell Tower. Northbridge is just less than 10 minutes away by foot for a taste of Asian food culture. Definitely my choice whenever I return to Perth for my next visit!!! Hotel was a very good choice for being in the center of the city. It is within walking distance to restaurants, shops and even the nightlife area. I would stay here again and would recommend this hotel to others. Booked the standard room. Room was clean. There is a washer and a dryer available for use at a low cost. The hotel is just a 5 mins walk to Perths's main shopping area and Perth station. You can take short train ride to explore Fremantle and Rottnest Island. Highly recommended! This Hotel is about 200meters away from Perth Train Station which is great. Many restaurants and shopping centres are nearby. Rooms are nice and neat. Small but practical. Set back- internet needs to be paid (AUD 10/day). Other than that, I had great stay and will return again. We were charged an extra $80 to check in before 2 pm. Otherwise, it was a great stay in a well located hotel in central Perth. I loved having a supermarket within a 3-5 minute walk away and easy access to shops and the free CAT bus. We will happily stay again. Tucked in the city centre, walking distance to malls, CAT busstop nearby makes it even more accessible. On the same stretch as 24hrs dining and nightlife. But at night there are homeless sleeping on the same road, not that we mind. Room is clean. Just too bad there isnt any breakfast for us. Definitely exceeds the service for 3* hotel. excellent location along murray street, pubs nearby yet comfort is not affected, economical for money, helpful friendly staff, clean rooms with daily house keeping. Coin operated laundry and snack counters. comfortable pillows and beds and clean towels. parking in the wilson carpark @ $20/night. walking distance to attractions in cbd... thumbs up! value for money! We stayed for a few nights at this hotel. Being located in the downtown area, the room is quite small but still acceptable. It is clean and comfortable. Location is a plus. very closed to shopping area, subway and eateries. all within walking distance. Wifi is only available in the lobby area and not the room. One negative thing for us is the parking. We drove a 12-seater van and the car is too tall to go into designated parking structure for the hotel. So we end up paying very expensive parking. Our stay was made unforgettable with the help of various helpful desk staff, among which one bespectacled lady who was red-haired was exceptionally friendly, helpful and went out of her way providing top level service to us. I was really impressed that the hotel allowed us an early check in, and that the staff were all friendly, attentive and helpful. Location was excellent- a mere 5 minutes from the subway. Would recommend to friends and family and return again in future. 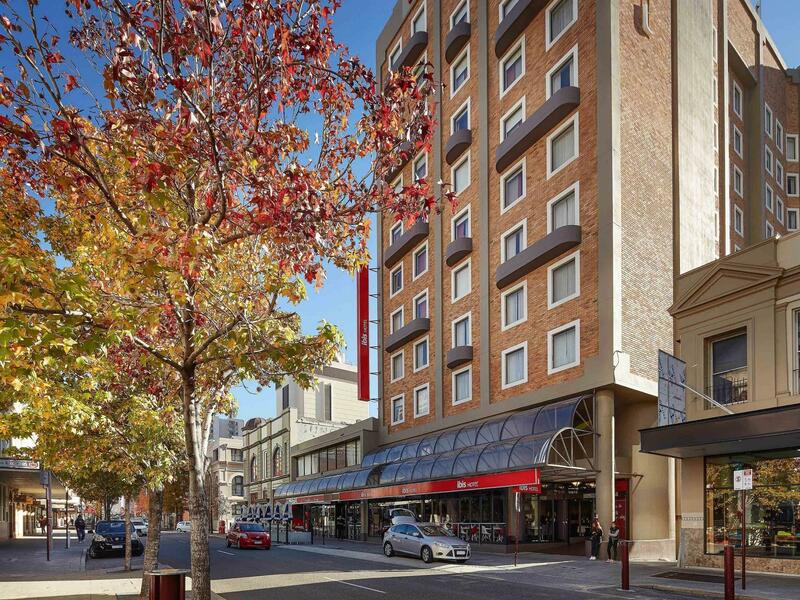 Location of the hotel is ideal, within a few minutes walk from Raine Square and also Murray Street shopping. There is also a car park available beside the hotel with plenty of parking lots. It is right in the middle of Perth City! Room size was nothing to shout about but the cleanliness and upkeep of the room is great. The best point was the great location which was 3 -5 min walk from train station, bus station, food and shopping. Overall, I would recommend this hotel for an economical yet enjoyable stay. Excellent, the staff upgraded our room to a suite which made the stay even better. Great location within walking distance to many great restaurants and bars. 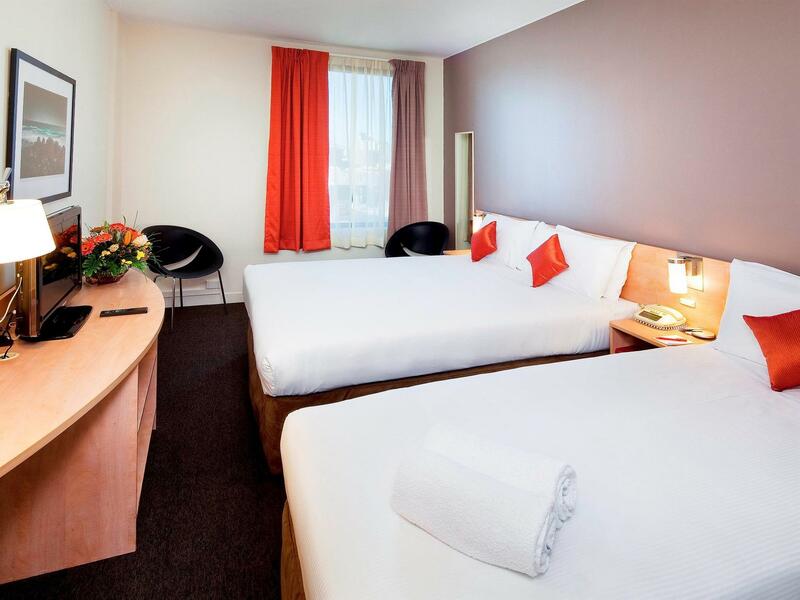 Great value for overnight stay in the city.